There are some tattoo design ideas that are perpetually in vogue, and one of these is the dogwood flower tattoo. For those looking for inspiration, there are some really cute designs for girls that also have symbolic meaning. The dogwood is an endangered species in Ontario, Canada. It also is the official flower of the North American state of North Carolina, starting from the year 1941. The dogwood (possible word origin: dagwood) tree is significant in Christianity. It is considered to be the tree from which the Cross of Christ was made. In Biblical times, the dogwood tree was supposed to be a huge tree, with a very strong bark, therefore chosen for the sad task of bearing Jesus Christ. The dogwood tree could not bear the sorrow of being the instrument of Christ's Crucifixion, therefore it asked the Gods for it to be made smaller so it would not be used for such purposes again. Since then, the tree is said to have grown much smaller than it originally was. It was either this or the dogwood was punished for its role in the Crucifixion, and thus diminished in size. 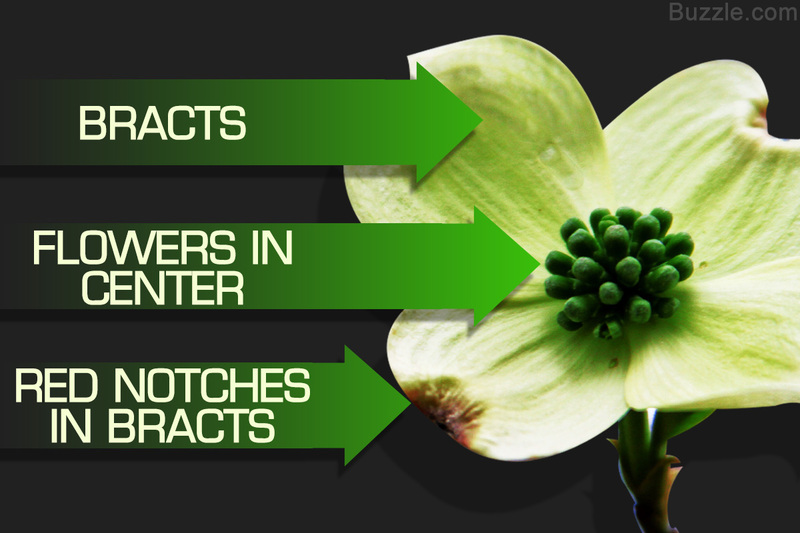 The white/red/pink/yellow part of the dogwood flower bloom is commonly mistaken as the petals. In fact, they are not petals. They are actually the bracts, which grow up to 3 cm long. The flowers themselves are too tiny to be seen casually. It is the bracts that everyone ends up tattooing. They come in several colors and shapes. The flowers in the center are symbolic of the Crown of Thorns. The bracts being four in number, symbolize the four arms of the Cross, and the little notches at the ends of the bracts resemble the skin that bleeds due to being pierced with nails. An American Indian myth tells of a maiden dabbing her wounds with the bracts of the dogwood, when she was attacked by a man she refused. 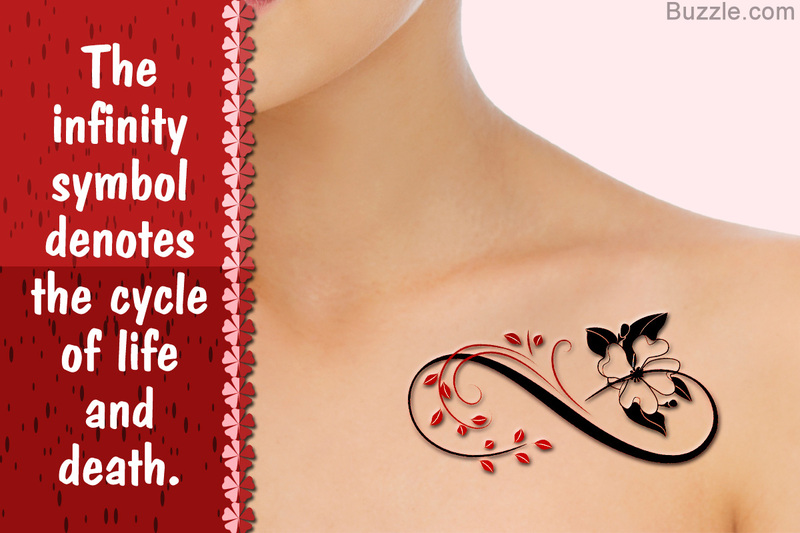 Dogwood tattoo designs are one of the most popularly chosen designs for girls, but men can opt for it too. The simplicity and symbolism of this flower makes it an ideal design, be it in color or not, for both sexes. 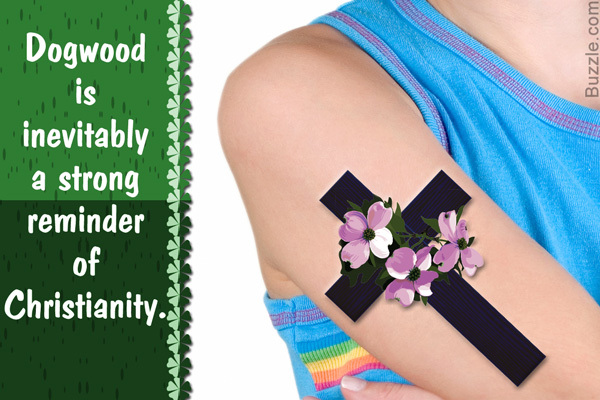 Dogwood tattoo designs can have both religious and non-religious connotations, depending upon the wearer. You can plan your tattoo such that it has only flowers, or you may choose to combine the flowers with any other religious or non-religious symbols. Nothing beats classic black and white tattoos. 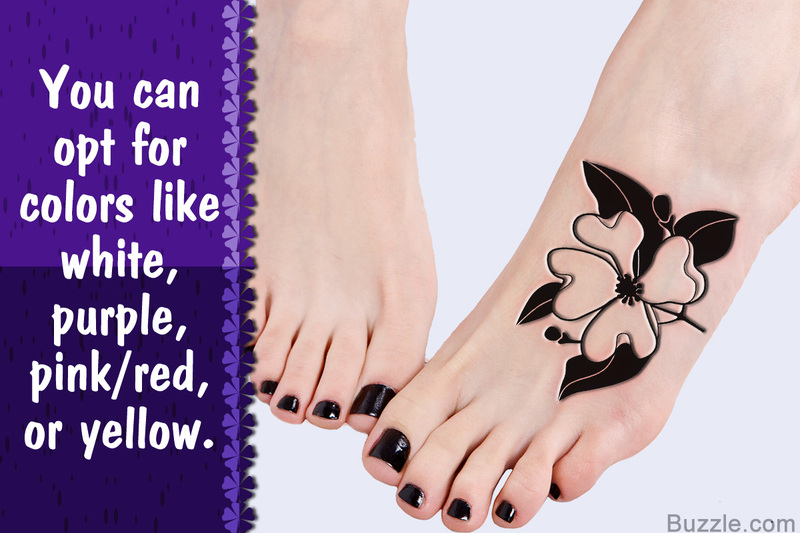 Though a lot of people prefer the tattoo to be colorful, a B&W never falls back. The flowers symbolize love, and you could add animals like butterflies or birds like doves that carry with it the combined meaning of innocent love. 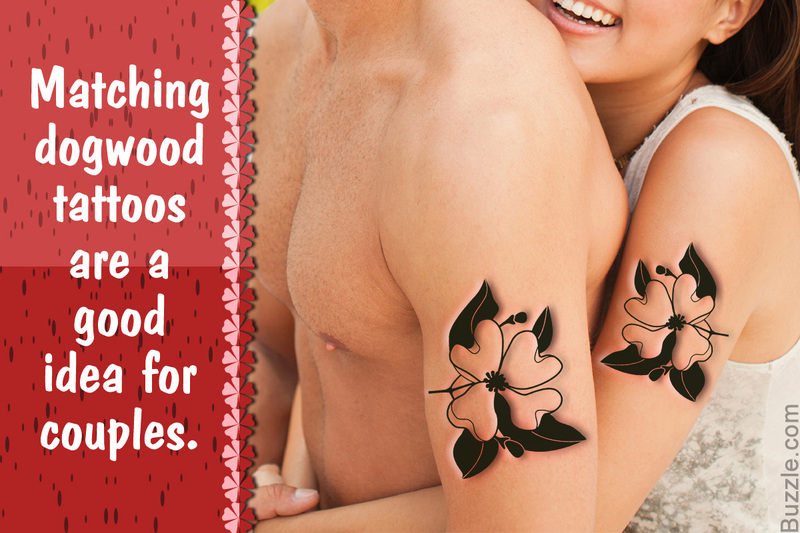 A pair of tattoos between partners also denotes undying love in the face of all adversity, so it could be a good idea to get matching dogwood flower tattoos after your wedding. A single dogwood flower (bract) could symbolize loneliness and unrequited love, if you believe in Victorian symbolism. 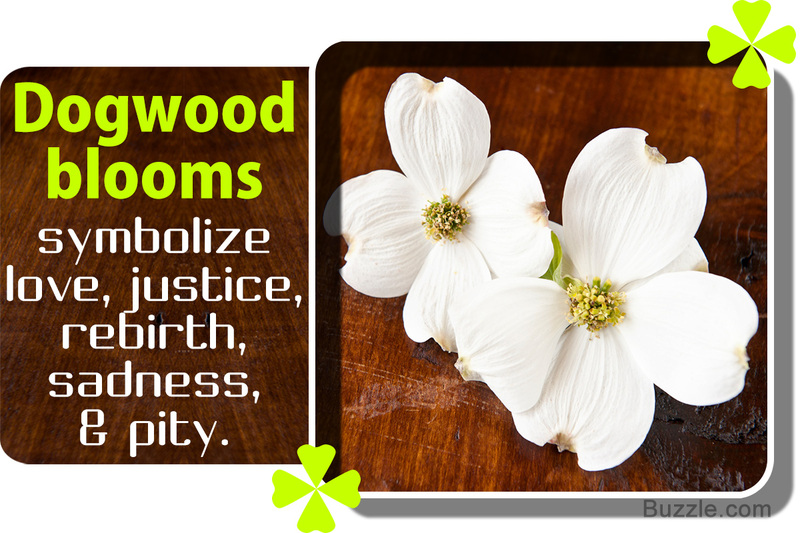 Victorian men of the late 19th century gave dogwood flowers to women as a sign of affection. If they were returned, it meant the man's love went unrequited. If you feel the same way despite being a lady, just get it done already! You can add colors like red, since red symbolizes pain and the blood of Christ, for those of you looking for religious symbolism. The dogwood branch is for people looking to add to their body art. It takes up some space, thus stands out very well. Make sure the number of bracts are exactly 4, because more or less can change the flower itself. 5 petals would resemble a cherry blossom branch, not dogwood. 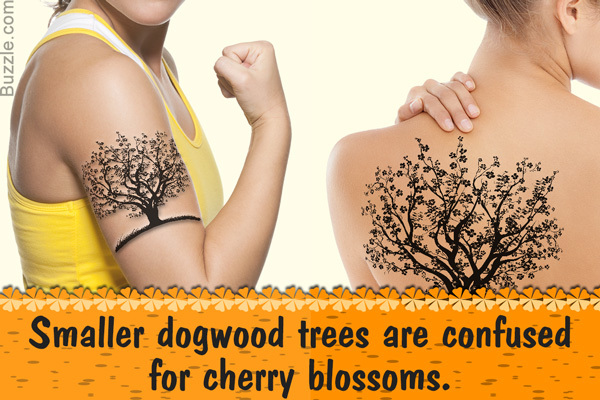 Instead of making just the flowers, you could tattoo a small or large tree. A larger one on your back or thigh would be cute. The tree would symbolize stability and long-lasting devotion, aspirations of improving the self, or durability unaffected by external circumstance. Whether it is a passage from the Bible or your own philosophical ramblings, a quote wrapped around the flower will add a certain charm to your tattoo. The dogwood tree blooms in early April, around the same time as Easter and is thus associated with rebirth and new life. Any other symbols associated with longevity, repetition, or cycles can be used along with the flower to bring out the meaning with clarity. 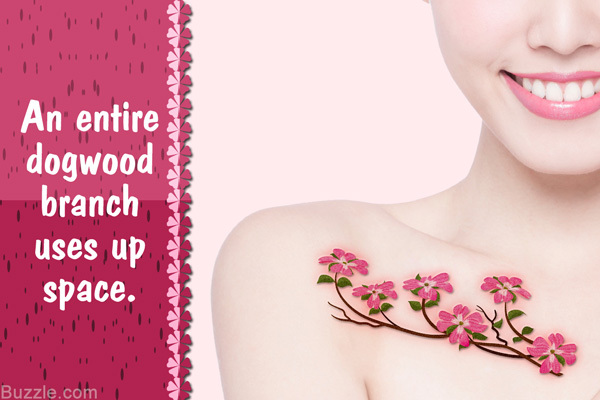 Dogwood flower tattoos depicting birds/animals feeding from its fruit symbolize the nourishing and caring side of a person who takes care of everyone. In some ways it could symbolize innocence as well. Combine it with an image of your child or loved ones. The plant's fruit is eaten by birds and beasts alike, and its boiled bark is said to be a comfort for dogs' mange, a skin disease affecting both dogs and humans in different ways, thus giving it a touching meaning. Designs of the flower combined with strictly religious symbols like rosaries, crucifixes, doves, or bread and wine will do very well. It may symbolize empathy, rebirth, rejuvenation, love or faith. You can combine the dogwood flower tattoo with tattoos of other flowers to symbolize different things. Specific combinations with particular flowers could be interpreted collectively. The poppy and dogwood together could symbolize death (poppy) and birth or rebirth (dogwood), thus symbolizing one complete life and death. There are more than 40 different varieties of dogwood, and if you would like subtle changes in patterns you can opt for other varieties that look slightly different from the North American variety. All in all, dogwood tattoos are brilliant ideas for girls and women, with clean designs, and uncomplicated. 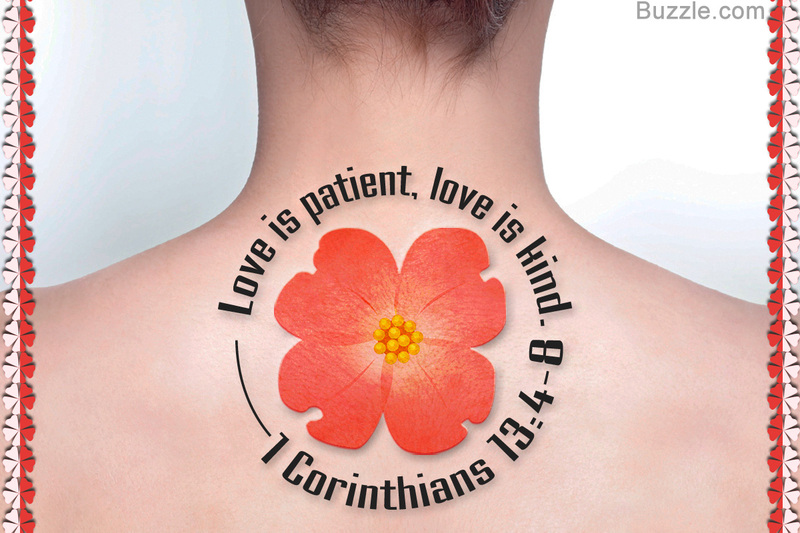 The possible meanings of this tattoo are varied, though almost all are positive enough to etch on to skin forever.